This play is based on the children’s book of the same title by Lois Lowry and adapted for the stage by Eric Coble. It is directed by Stan Foote (OCT’s Artistic Director). The show will play through May 19th at 1111 SW Broadway. For further information go to www.octc.org or call 503-228-9571. The world of the Future is almost always pictured as a desolate, despairing and depressing place by Sci-fi writers. This play is no exception. It is not to say they’re wrong in their assessments, but where is the Hope for a better tomorrow, the elusive Eden of yesteryear. It may be, as the poet said, “The World is too much with us.” And thus, we are thrust, screaming, into our own Apocalyptic blankness. Hints of Lowry’s world are glimpsed in Clive Barker’s book, Weaveworld or Shyamalan’s film, The Village. But in the children, we see the light of brighter possibilities. The child, in this case, is a young lady named Kira (Stephanie Roessler), who has inherited the Art of Weaving a robe that reflects the Past and will influence the Future. She is lame and would have been relegated to the Bonefield, as all undesirables are, had it not been for this gift. 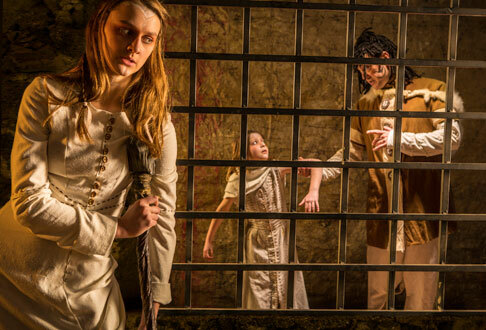 She is housed in a special place called the Edifice, in which she is to work her wonders on the cloth, along with her boy-servant, Matt (Peyton Symes) and a Carver, Thomas (Jeremy Howard), who has the talent of writing, etching and reading. Their keeper is a stern fellow named Jamison (Andres Alcala), one of the Guardians, leaders of this society. In order to complete her task, she must learn colors from a wise old woman named Annabella (Camille Cettina). But in order to complete the robe she must find the color blue, which does not exist in this world. She discovers the reason for this is that blue represents Freedom. And so, the search continues, in which they find an imprisoned girl, named Jo (Steele Clevenger), who has the gift of Song. The story gets a bit bogged down at times because of the vast amount of information it needs to share. But Mr. Foote keeps the pace flowing with inventive and simple scene changes and a cast that is rarely static. The designs of the set (Mark Haack) and costumes (Sarah Gahagan) are remarkable. They give one the sense that you are really there. A cast of eight does a wonderful job of playing multiple characters. Ms. Roessler in the lead role is believable and quite convincing as a lame girl. Ms. Cettina in a couple of very contrasting roles is quite the actress, giving the energy needed, as well as convincingly transforming. And Mr. Alcala does nicely, as he gives an air of mystery to his character, in which one is never sure who he is or where he stands. Most of the rest of the cast is equally good with the exception of Mr. Kelly, at times, who needs more of a sense of urgency, of animation, to his character. He is a little too bland in a role that should be exploding with emotion. But he has the right look and voice for the part. I would not recommend this play for very young children, as it is pretty deep and complex and they might not grasp the meanings. But I would recommend it for all others, as it is a thoughtful and well presented piece. If you do choose to go, tell them Dennis sent you. 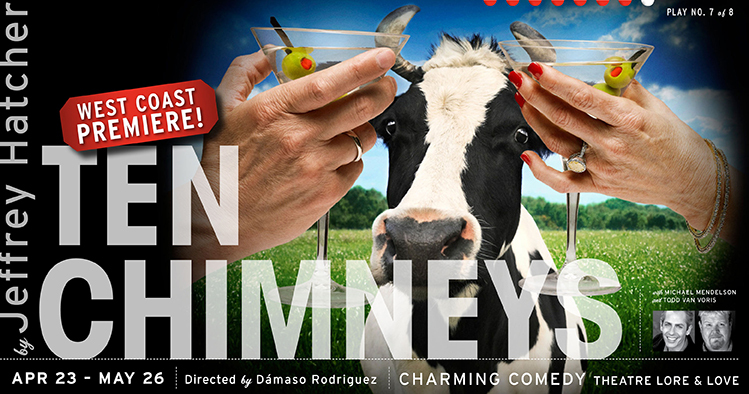 This dramatic comedy by Jeffrey Hatcher is directed by Artists Rep’s new Artistic Director, Dàmaso Rodriguez. It plays through May 26th at its location on SW Alder St. & 16th Ave. For more information contact them at www.artistsrep.org or call 503-241-1278. Stage “royalty” has been around since the inception of the Broadway theatre. Going back to the Civil War, there was Edwin Booth and later Helen Hayes, the Barrymores (exemplified in the play, The Royal Family) and, of course, Lunt and Fontanne, among them. This story concentrates on a period of time, mostly in the late 30’s, when they were mounting a production of Chekov’s The Seagull. And it also includes such luminaries from that period as the actor, Sydney Greenstreet (The Maltese Falcon, Casablanca) and theatre actor/teacher, Uta Hagen (her book, Respect for Acting, is considered one of the bibles of the theatre world). The play shifts from delving into the private lives of Alfred Lunt (Michael Mendelson) and Lynn Fontanne (Linda Alper), to their stage incarnations, as well, and the creative process. 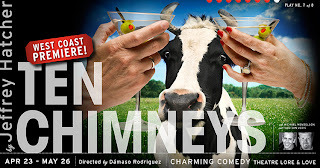 The story takes place at their estate in Wisconsin, Ten Chimneys. In the cast are Mr. Greenstreet (Todd Van Voris), pre-film, and Ms. Hagen (Abby Wilde), early in her career. Also living at their estate are his over-bearing mother, Hattie (JoAnn Johnson); his pool-shark, half-brother, Carl (Chris Harder); and his frustrated, half-sister, Louise (Sarah Lucht). Into this well-seasoned stew are added the portly Sydney, whose wife has been incarcerated in an institution for the insane for a number of years and Uta, who seems to have dreams of becoming a star, no matter what the cost to personal lives. Alfred, who had possibly had an affair with a college “room-mate,” as some indiscreet letters have appeared, is distracted. And Lynn, aware of the attraction between her husband and the neophyte, alternately explodes, then consoles the volatile parties. Life imitating art or vice versa? Or, both? Into this mix also are some of the basics of theatre and the rehearsal process. They are constantly rehearsing so that the lines become automatic and real, like a second skin. And if they miss so much as a word, they must start the whole scene over again. This is not the only way of creating a play, but it is their way. The constant immersion in the creative process and their stage lives might seem foreign to a casual observer. But it may be essential to the artist. This idea is explored in its simplest form in Vonnegut’s, Who Am I This Time? And this may be, in part, the theme of Hatcher’s play. One’s life onstage may be the reality, and the life outside it, the illusion. To extend that thought further, aren’t we all, in a way, actors. Perhaps not in the creative sense but “All the world’s a stage…,” as expressed by the Bard. We “act” differently when we are with family, with friends, with co-workers, with strangers, etc. And, if true, then the play speaks to all of us, not just artists. The Director, Mr. Rodriguez, has wisely chosen not to have the actors try to imitate the famous personages, but simply enact the character. He understands the rhythms of the play and has a superb cast that complements this. Mendelson portrays all the various flavors and beats of this complex person, Lunt, and Alper is equally fine as Fontanne, raging to heights as the wronged woman, then to calmer depths, as the helpmate to the artist. And Johnson is extraordinary as the mother, running the gamut from having us hate her, to feeling sorry for her. A super performance by a seasoned veteran. Wilde, as Uta, is wonderful in her ability to keep her motives hidden, as she traverses the slippery slope between, perhaps, romancing her way to the top, or becoming a dutiful actress, willing to learn and observe. You can see her thinking, considering choices as she navigates her course. Harder and Lucht portray the siblings of this famous couple, convincingly showing us the ups and downs of reaping the gains f the trip, but constantly riding in the back seat. The set, by Larry Larsen, is open, allowing the actors plenty of room to emote and is versatile, as it magically changes from an exterior to interior by the second act. A beauty. This is a winning example of what the future may hold for ART under the reins of the capable director, Mr. Rodriguez. Bravo! I recommend this production. If you do choose to go see it, please tell them Dennis sent you. 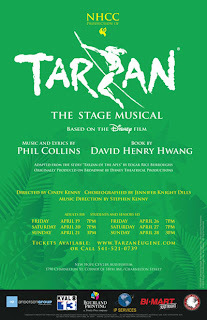 This musical, based on the animated Disney film, will play through April 28th. It is written by David Henry Hwang and music/lyrics by Phil Collins. The production is directed by Cindy Kenny, choreographed by Jennifer Knight Dills and musical direction by Stephen Kenny. The school is located at 1790 Chamelton St. in Eugene. Go to www.newhope.edu for further information. The story is adapted from Edgar Rice Burroughs’s Tarzan of the Apes. Burroughs was, along with Verne and Wells, one of the great adventure writers of the past century. A number of films have been made on this character and it was finally adapted to an animated musical by the Disney team. They, in turn, developed it for the stage, along with Mr. Collins and Mr. Hwang. And now it arrives in Oregon, with six new songs added. For all you tecko-geeks, twitter-tweeters and those who follow the all-knowing Lord, Facebook, you are probably not going to like one of the themes of this show. That flora and fauna do have something valuable to offer mankind and that maybe a life in Nature’s Wonderland is superior to an existence in a Concrete Jungle. And, coupled with Love, it is an unbeatable combination. After a shipwreck, Tarzan’s parents escape to the safety of the jungle, only to be killed by a leopard. But the Boy Tarzan (Issac Sutherland) is rescued and raised by a kindly mother ape, Kala (Natalie Pruett), who is shunned by her mate, Kerchak (Jacob Thiessen) for this, because the boy is not one of them. He slowly learns their ways and language with the help of Kala and a goofy friend, Terk (Chris Kiriakos). But the modern world will force its ugly head upon them in the guises of a kindly, English Professor, Porter (Larry Kenton) and his lovely daughter, Jane (Christina Brown—featured in TV’s High School Musical: Get in the Picture). Of course, relative peace will not continue, as another god of the modern world, greed, comes calling. Clayton (Zach Ropp), the guide of the expedition, sees a way to make money with kidnapping some apes and, perhaps, the ape-man himself, Tarzan (Issac Frank). After promising to “reform” and become a “proper” Englishman, tragedy strikes and Tarzan is left in charge of the ape tribe. But True Love has a way of working its magic, so that things can take their natural course. Burroughs’s story is a lot more complicated than this, but the musical does hit the highlights. For the most part, the songs/music keeps the story flowing forward. Only during the butterfly dance number, beautifully rendered by the Hosanna Dance Studio Dancers, does the story take a slight pause. The songs are all part of the story, taking on an almost operatic quality in storytelling at times. Some of my song favorites were Who Better Than Me, with the Boy Tarzan and Terk; You’ll be in my Heart, Kala; Son of Man, Tarzan & apes; and the show-stopping, For the First Time, Jane and Tarzan, beautifully sung by both of them. And one cannot ignore, one of the highlights of the evening, the Ape Dancers, so good that they all deserved to be named: Brianna Cruz, Millie Freeman, Jasmyn Kahawai, Nora Mercier, Amanda Prussak, Liz Strang, Lauren Talamantez, Signe Tapert, Brittany Torricer, and Rachel Ure. And one has to give supreme credit for them to the Choreographer, Ms. Dills! They lit up the show every time they appeared. In the title role, the person must be athletic, acrobatic, physically fit, a good singer, actor and dancer. Not an easy bill to fill. But Mr. Frank is more than up to the task. He is downright amazing in all these guises. It was as if Burroughs (and even Disney) was using this actor as a model for the character. He has a career ahead of him in this field, I believe, if he chooses to pursue it. As Jane, Ms. Brown is an extraordinary singer. At times, though, her acting was a little broader than needed to be, for the size of space she was in. But, other than that, a perfect Jane. Another favorite of mine was Ms. Pruett, as Kala, Tarzan’s surrogate mother. She has a beautiful voice and is a terrific actor. She, too, has star-shine in her future, in my opinion. And master Sutherland, as the Boy Tarzan, handled his role with ease. Hopefully he will also continue in this field, to grow and learn. Also, very impressive, was Mr. Kenton as Professor Porter. He has an easy-going, natural demeanor onstage that makes you believe everything he does and says. He has a very good singing voice and his concern for his daughter seemed genuine. In short, he accomplishes the task of every actor, to find Truth in the character he’s portraying. All the others actors were very good, and the ape ensemble, very convincing. There was not a weak person in the cast. And, for once, the miking worked throughout the show, and the orchestra did not overpower the singers, a rare accomplishment. Credit must be give to Stephen Kenny, the leader of them, and the Producer of the show. Bravo! This is a monumental effort to transfer to the stage. The Director, Ms. Kenny, must be equals parts traffic cop, interpreter, counselor/consoler/promoter, teacher and the-buck-stops-here person. Cindy is a wiz in all those departments. She has managed to translate all these creative fragments into a cohesive production and she does it with class. It is noted in the program that this is her first foray into the directing spotlight. I, for one, vote that it not be her last. And one cannot leave this show without congratulating the Lighting/Stage Designer, Kelly Baum, the Costume Designer, Jonna Hayden and the audio designer, Kyle Anderson. Quite simply, this production would not have been the success it is, without the talents of these remarkable people, too. The only regret one should have is that it is only running two weekends. I would hope they might consider extending the run. If this is an example of the type of talent and dedication to the Arts that this school has, then I would say it is an example of one of the best institutions for such training. Obviously, I highly recommend this show. If you are thinking of going, get your tickets now, as they are selling out fast. If you do choose to see it, tell them Dennis sent you. Clive (Jack) Staples Lewis was a well-respected writer and teacher from Oxford in England. Much of the subject matter of his books and lectures concerned Man’s relationship with God. But his most famous books were the Narnia collection, which have been made into more than one film. In fact, he was, also, good friends with J.R.R. Tolkien, writer of the Lord of the Rings books, also filmed. 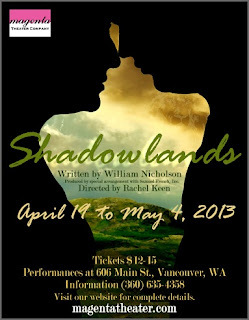 Shadowlands was made into a movie starring Anthony Hopkins, Debra Winger and Edward Hardwick. The story takes place in the 1950’s in Oxford, his home for most of his life. Jack (Philip Giesy) and his older brother, Warnie (Bob Lawson), were confirmed bachelors and roomed together. Jack was constantly exploring the relationship between God and Man, questioning why, if there was a God, he would allow so much suffering in the world.